This hand-painted cel captures the essence of a classic moment from a cartoon directed by renowned animation artist and director Chuck Jones. The wuvely Valkyrie Brunhilde is enraptured by the operatic sounds from Seigfried Elmer in the ritualistic courtship of Wagners…er, Warners Bros. cartoon parody. What’s Opera, Doc? was voted the number one cartoon by historians, film critics and film directors out of thousands in the book ‘The World’s Fifty Greatest Cartoons’. 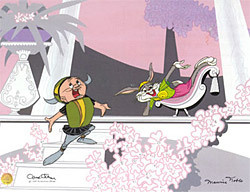 Inspired by the original 1957 cartoon scene in ‘What’s Opera, Doc?’, Jones created the original artwork used to produce this edition. Each cel is hand-signed by Jones, signifying his approval. This edition is also signed by background legend Maurice Noble, who created the backgrounds for the original production, and the background for this edition.